If your looking for a cabin in the woods - you have finally found it! An original cabin structure with many interior upgrades. A beautifully remodeled kitchen with granite counter tops and wine cooler. Imagine relaxing in a wonderful outdoor hot tub in a breathtaking mountain setting and more trees than you can count! If you can tear your self away from the comfort and quiet peacefulness of the cabin located on Peak 7, you are close to town and just minutes away from the Breckenridge Ski Area where you can find enough fun to fill a whole day! This two story home showcases the main (downstairs) level with kitchen/dining/living area all open to each other for easy socializing. 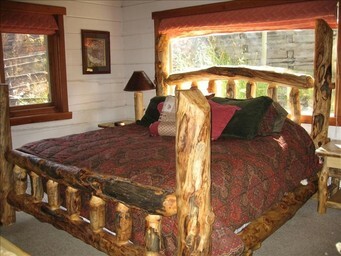 This main level also has a Mater bedroom and bathroom with a King size bed. Here you will also find the laundry room. Upstairs offers an authentic Queen bedroom and a second bedroom with a twin bed and second twin bed pulling out from underneath. For those coming with precious little ones there is a high chair, pack-n-play and baby monitor to give you the ease and comfort a vacation requires. Enjoy the outdoor hot tub as you relax on the deck, you can enjoy the beautiful pink skies at sunset, or on clear nights be amazed at the million and a half stars in the sky. When you think of Colorado and your perfect 'mountain vacation' this is the house you envision! We know how hard it is to leave your furry friend at home, so your welcome to bring your dog along too. They especially like the hiking and snowshoeing!